The Coat of Arms of Uganda is centered on a shield and spears on a green mound. The shield and spears represent the willingness of the Ugandan people to defend their country. There are three images on the shield: those on top represent the waves of Lake Victoria; the sun in the centre represents the many days of brilliant sunshine Uganda enjoys; and the traditional drum at the bottom is symbolic of dancing, and the summoning of people to meetings and ceremony. 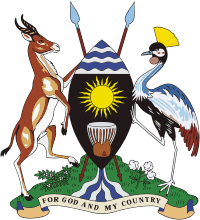 The shield is flanked on the right by a Crested Crane (Balearica regulorum gibbericeps), a subspecies of the Grey-crowned Crane and the national bird of Uganda. On the left is the Ugandan Kob (Kobus kob thomasi), a species of Kob that here represents abundant wildlife. The shield stands on a green mound, representing fertile land, and directly above a representation of the River Nile. Two main cash crops, coffee and cotton, flank the river. At the bottom is the national motto: "For God and My Country".